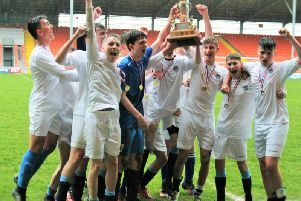 The season is now drawing to a close in the Blackpool and District Youth Football League. The Under-7s teams had an end-of-season festival, marking the first season of Saturday football in the league, which has turned out to be a huge success. There was plenty of good football on show for all the parents and spectators to watch and to see the improvement of all the players from the start of the season was wonderful. On Tuesday, the U13s’ divisional runners-up, Blackpool Rangers Tangerines, and divisional winners, Kirkham Juniors Reds, played their final match against each other. Even though Zico Allen scored all four goals for Tangerines they could not stop the Reds from winning 6-4. Kirkham Juniors Reds have one match left to play against Warton Typhoons next Saturday to conclude the season. The U14s’ division concluded on Thursday with a match between Lytham Juniors Blues and Thornton Cleveleys Whites at Park View. A fabulously contested match ended all square at 1-1 even though both teams continued to the end in trying to get the winner. 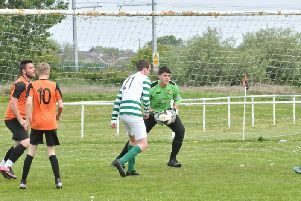 In the U18s’ section Blackpool Rangers played Foxhall Hoops in another great game of football where both sides never gave up and played some good football. The match finished with honours even at 2-2; see pages 24-25 for more information. U13 winners: Kirkham Juniors Reds. The Blackpool and District Youth Football League will be offering football again for U7s to U18s next season with Hogan Cup and Plate competitions for all age groups.